Returning for summer 2019…label.m Sun Edition, the ultimate hair travel edit, comprising of four key haircare essentials in a limited-edition holographic travel bag with no customs restrictions to suit every vacation. Each product helps prevent hair damage caused by the sun, sea salt and even chlorine, with added UVA/UVB defence fighting against ageing and dullness caused by UV rays. What's in the Travel Edit? 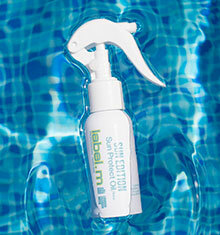 An intense conditioner to hydrate hair. UVA/UVB filters and anti-chlorine molecules protect hair from further damage and work to counteract damage caused by climate-exposure. 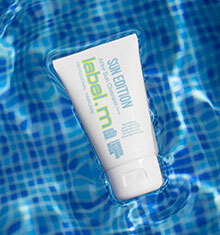 The perfect balance of moisturising goodness and protection from sun damage, chlorine and salt water, containing UVA/UVB filters and anti-chlorine water molecules. A protein boost for when you need it most. Developed with label.m’s exclusive Enviroshield Complex, it protects hair against heat styling, UV rays, evens out porosity, maintains colour and replaces naturally lost keratin protein. 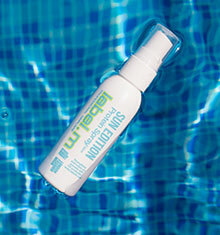 A deep-clean shampoo developed to help remove chlorine, salt water, sand and sweat. It protects against colour fade, whilst repairing thermal damage.